Kenwood have just completed works at a large mid terraced home in West London. We were contacted by the owner’s contractor to inspect dampness affecting the kitchen wall in the property. We worked with the other onsite contractors to ensure our works ran smoothly in conjunction with theirs. Kenwood’s operatives removed the wall plaster to expose the brickwork below. We then drilled a series of 10mm holes into the mortar course and injected the damp proof fluid into each. The treated walls were then re-rendered and skim finished ready to be redecorated in approximately 4 weeks. With our works complete the contractors can complete the rest of their work schedule. 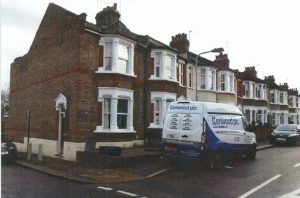 Our client can now continue to enjoy their home in the knowledge that the property will be free from dampness.